Learning To Get Along Book Series - "Are not"
This wonderful series of books is offered in hard cover for the younger child and soft covered for the slightly older child. HARD COVER: This wonderful series of four 24 page board books help toddlers and pre-school aged children learn to behave responsibly and respectfully toward themselves and others. Simple child friendly language and inviting, upbeat full color illustrations teach and reinforce important concepts and alternative behaviors. Virtually indestructible, the books are perfect for home, daycare and preschool settings. May also be helpful for older children as a jump off place for building their ownâ€�Social Storiesâ€�. 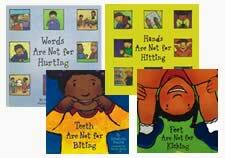 Each book provides helpful tips for parents and caregivers. SOFT COVER: Longer, expanded version of the titles from the Learning to Get Along series. For older children, these 40 page books cover each topic in detail using more sophisticated language and meaningful examples. Both books also include a section for adults with discussion starter ideas and supplemental activities. A must for kindergarten and early elementary classrooms, after school programs and the home.